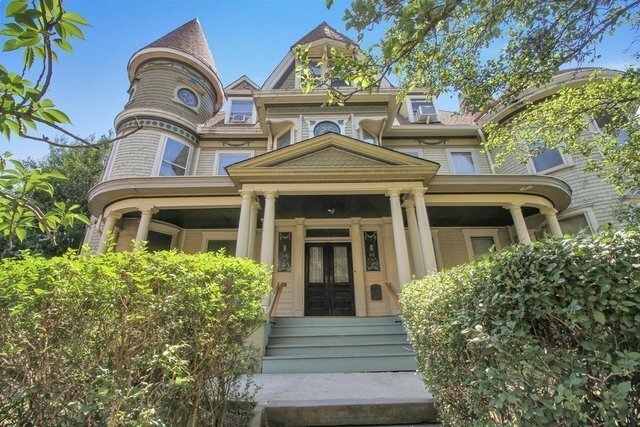 Attention Investors: Approximately 5,000 Square Feet of a Rare 4 Family, Queen Anne Victorian Mansion in a prime corner location. Awarded Jersey City Landmarks Conservancy for Excellence in Preservation; this Historic home features a majestic entry with a Cathedral Ceiling Staircase, 13 antique stained glass windows, inlaid ribbon hardwood floors, coffered ceilings, intricate period moldings, 4 ornate Fireplace/Mantle pieces, pocket doors and a large, inviting front porch. A private, serene side yard and Parking complete this residence. New roof & new boilers, 4 meters. Low Taxes. Perfect for AirBnb Income! or Condo conversion. Versatile, massive home with endless possibilities! Close to PATH, beautiful parks & more..